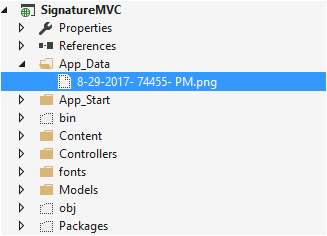 How to save the Signature image to a folder in an application? The Signature control by default records the drawn signature in Base64 string format for later regeneration. Hence, we can use this to store in folder in your application. Initially convert the signature value to the Base64 string value by using the canvas toDataURL() method and then pass it to controller action by using jQuery AJAX post. Specify the file name and path to save the signature using FileStream. Convert the image’s Base64 string value to the image using BinaryWriter. The following code explains how to store signature image to a folder in an application.